The Tiltpod adapter is the perfect portable balancing platform for your compact camera. 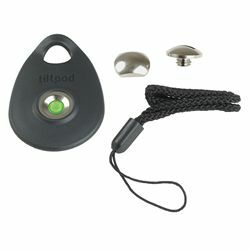 Designed to be carried on a key chain or in your pocket, the Tiltpod makes it easy to stabilize and aim your camera. Magnetic bases make it easy to effortlessly adjust the tilt to the perfect angle. Magnetic base can be quickly attached and removed from the camera. Works with most compact cameras and Flipcam video recorders. Includes camera wrist strap, a screw mounted pivot, and an optional stick-on adhesive pivot for cameras with off-center tripod sockets. Maximum recommended camera weight is 7 oz. (200g).